Our super busy lifestyle leaves us with hardly any time to experiment with food items in the kitchen (on our own). Hence, most of us either prefer to eat out, depend on packaged or ready to eat dishes or best, stick to good ol' Maa ke haath ka khana. But, what about days when Mama dearest is busy with urgent commitments? Or for those who stay alone? I personally don't prefer ready to eat, packaged food items, and eating out is a strict no-no on most days (and I have just come out of a horrible week long sick leave, thanks to a bad case of food poisoning). 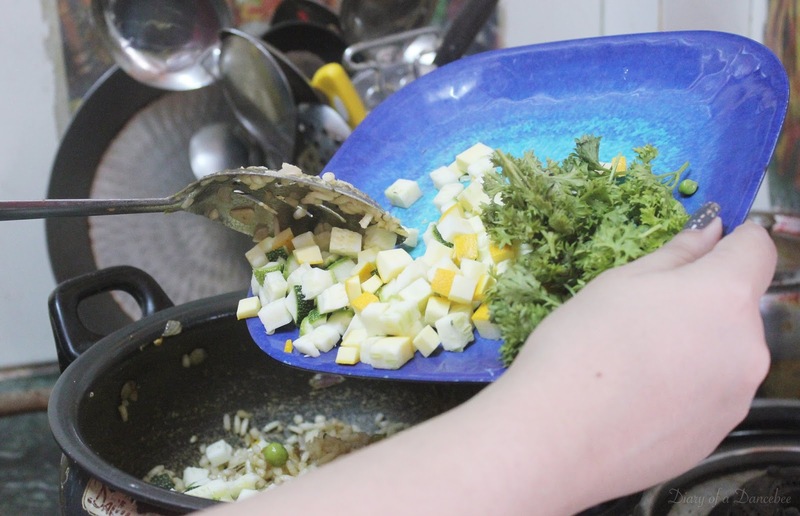 Recently, Faasos introduced me to a super cool DIY Recipe Box by Cheflery, where I could prepare various cuisines using fresh ingredients, right at the comfort of my own kitchen. I was given the option to choose between vegetarian and non-vegetarian dishes (Since I am a vegetarian, I opted for the former) and voila! 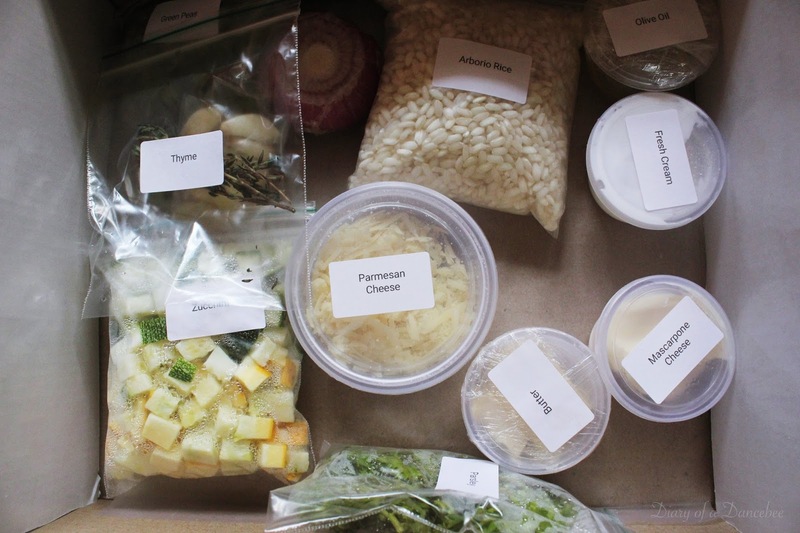 The DIY recipe box was home and I was 40 minutes away from a bowl full of Vegetarian Risotto. 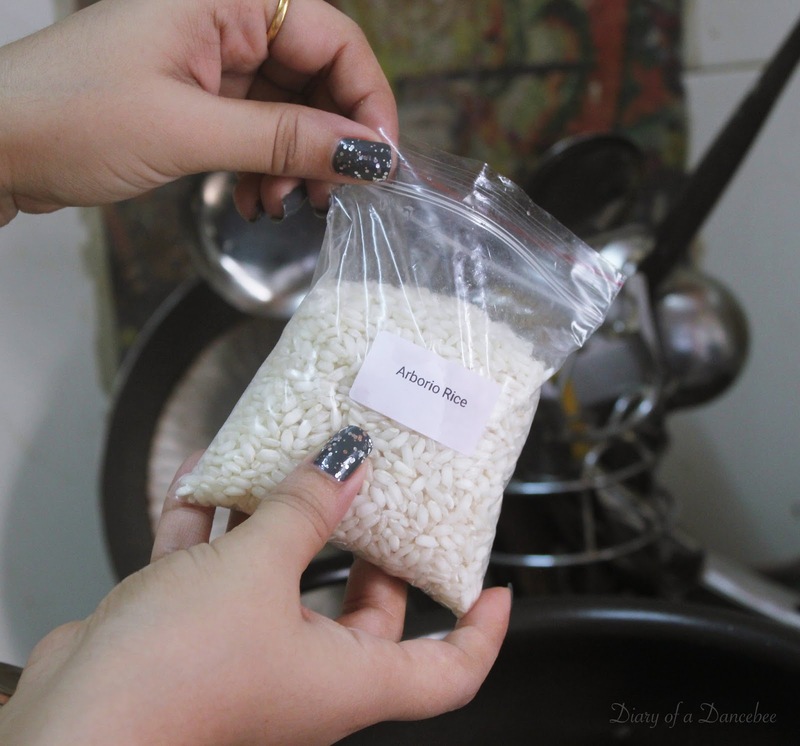 Read on to know the full recipe and my thoughts on Faasos and Cheflery's latest offering. What's it about? 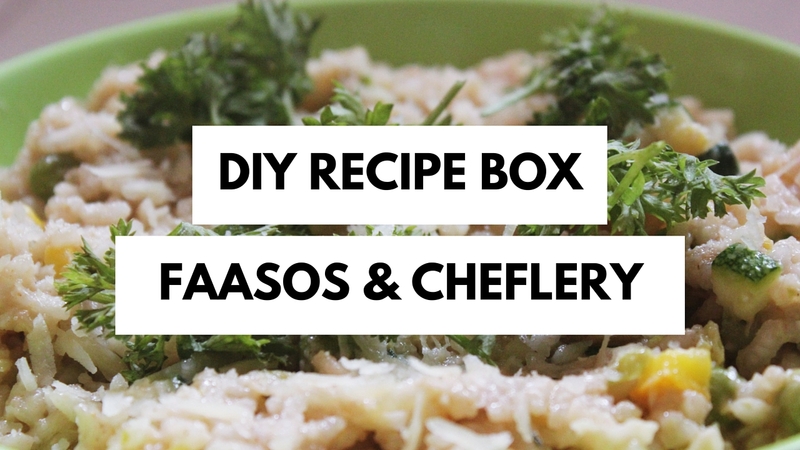 - Faasos and Cheflery's DIY Recipe Box comes packed with all the ingredients required to make a particular dish, giving you the chance to cook a healthy, home made meal, without stepping out to stock up on grocery / vegetables. 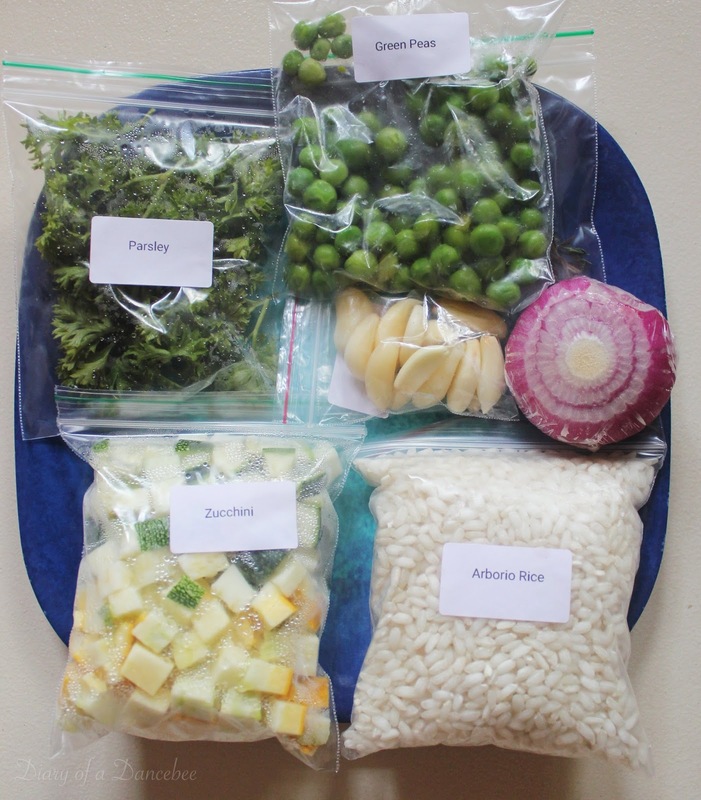 What to keep in mind before cooking? 1. Finely chop onion, garlic and parsley. Pluck the thyme. Split butter in 2 equal parts. 2. In a hot non-stick pan over medium heat, add oil and then, chopped garlic. Saute the garlic till it turns golden brown and then add chopped onion. Saute the onions till they turn slightly brown. Add butter (1/2) and stir for a minute. 3. Continuing on medium heat, add arborio rice to the mixture and stir for a minute. Add 100ml water and stir for a minute. Then, add peas and 1/2 teaspoon salt. Stir for a minute. Add 100ml water again, followed by 2 pinches of pepper and stir for 4 minutes. Add 100 ml water again and stir for 4 minutes. Add 100 ml water again and keep stirring for 8 minutes. 4. 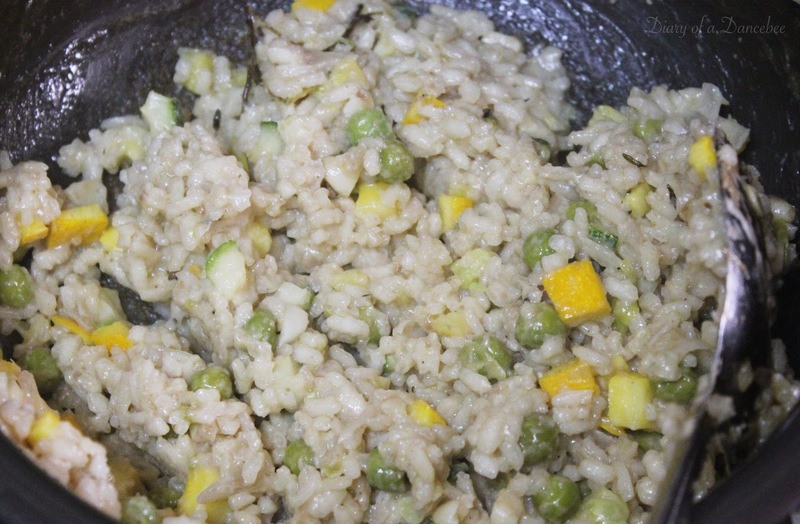 Add diced green and yellow zucchini to the rice and stir for 4 minutes. Add 40ml water and stir for 3 minutes. Add mascarpone cheese and stir again for 3 minutes. 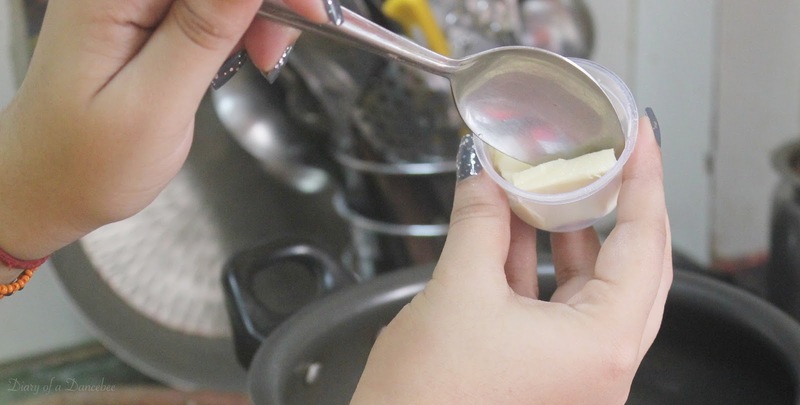 Add the remaining portion of butter, followed by fresh cream and keep stirring continuously for 3 minutes. 5. Add parmesan cheese (3/4) and mix well. Finally, stir for 3 minutes. 6. 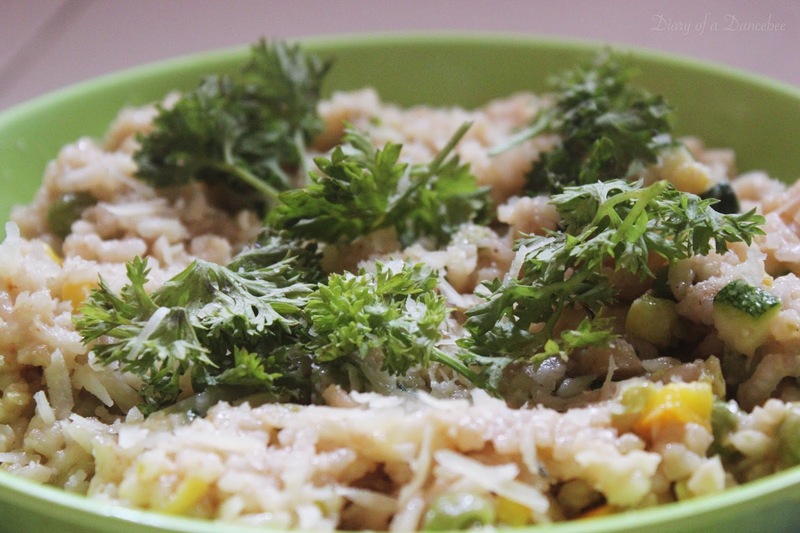 Place the risotto in a plate / bowl, sprinkle the remaining portion of parmesan cheese and garnish with chopped parsley. Serve hot. 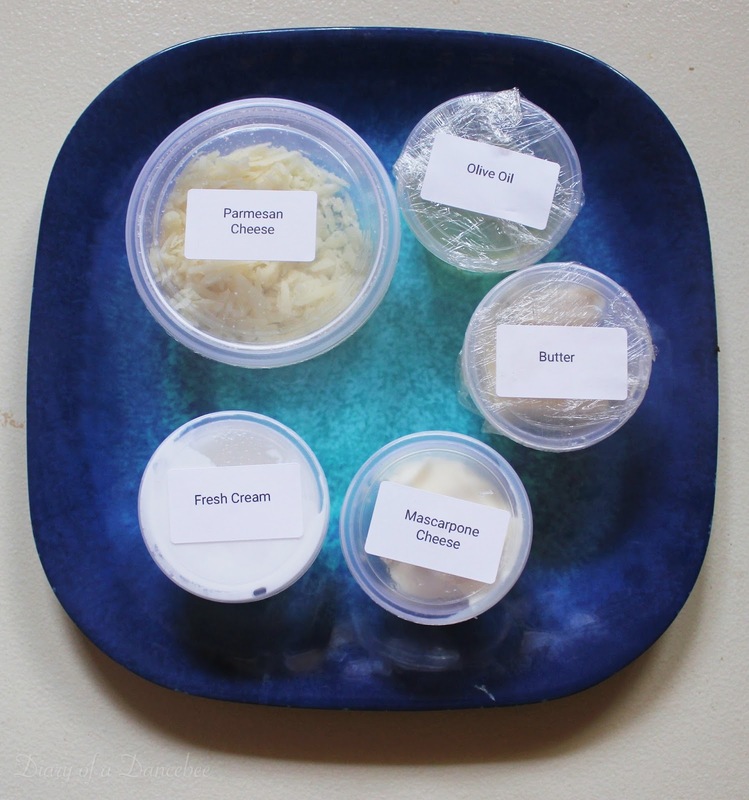 Experience: What we loved about the DIY recipe box was the fact that each ingredient was well packed, especially items like oil and butter, which can get messy if not packed properly. The vegetables were fresh and packed separately too. All the main ingredients were packed inside, except salt and pepper, which of course, a staple in every house. So, that's the only requirement from your end. The box came with an instruction sheet, which had the entire recipe and other details mentioned neatly. While the cooking time was exactly 40 minutes, the entire process of unpacking, chopping among other things, took the total time to an hour. So, on the time front, it's the number of hours spent for your trip to the market that gets saved. While the pros top the list, there is a tiny con too. The cook needs to have a proper idea of the timings and portions. For e.g: Adding water. 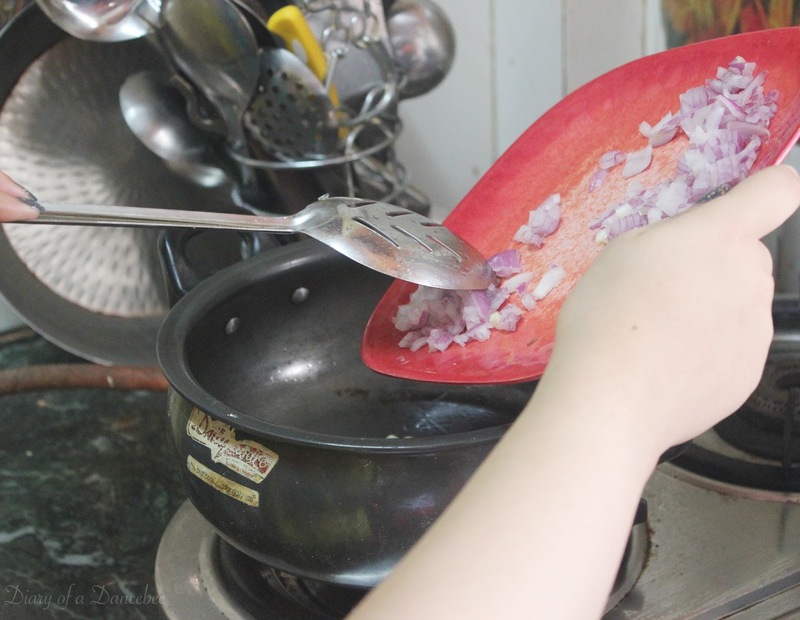 If you end up messing this part, your entire dish goes for a toss. 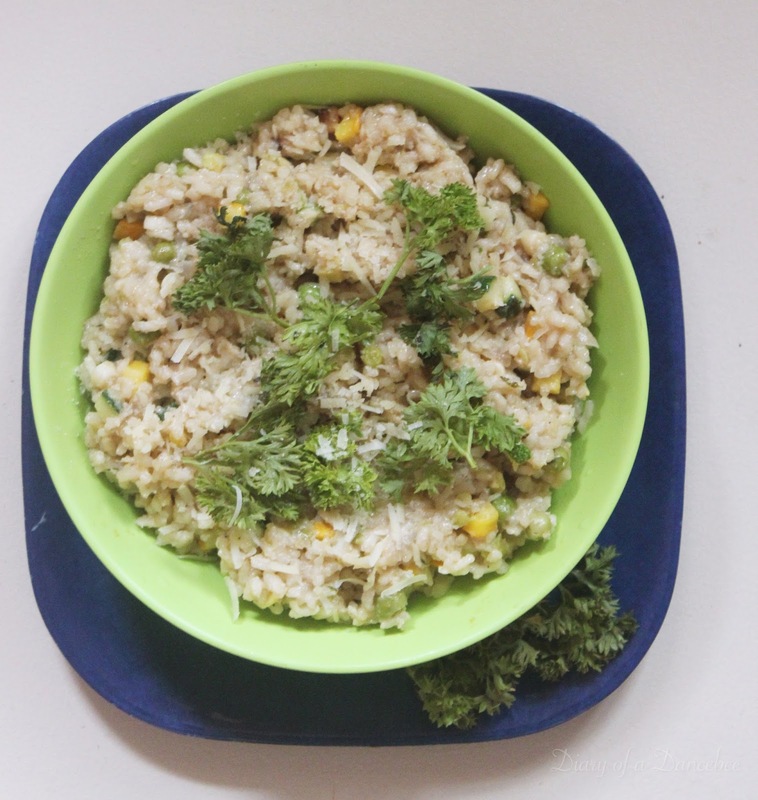 If you are new at cooking, try making this with your mom or an expert first. 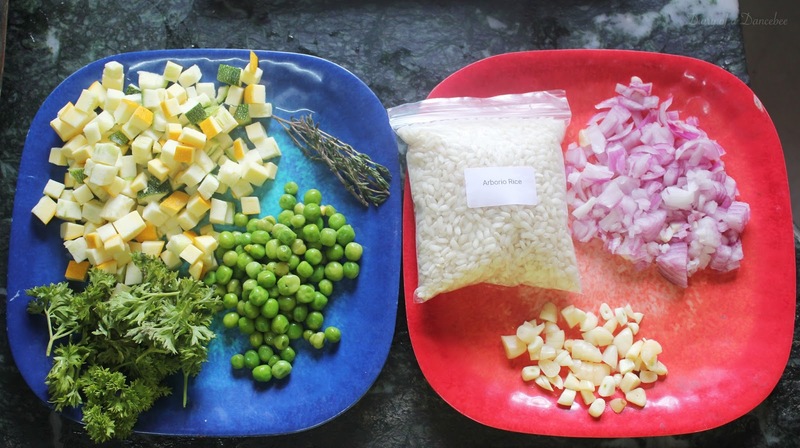 Getting an idea of the right mix of ingredients, spices, water and time spent on stirring is very important. Taste wise, the risotto was lip smacking. It had the right mix of flavours, cheese and a lovely aroma of thyme. The rice wasn't too sticky, and tasted yum. Unlike the terrible taste of frozen peas, the green peas used here was fresh and perfect to chew. We finished the portion with a huge smile on our face. 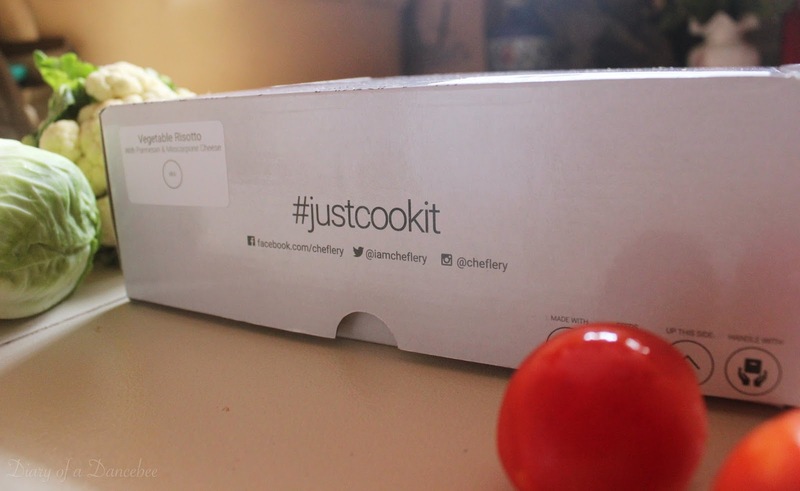 Verdict: A value for money meal, with fresh, healthy ingredients. Saves time, stops you from going out to gorge on unhealthy street side food. The portions are huge and fit for two individuals (or one person who is super hungry). They have got some interesting recipe kits available currently, which includes Mexican Bean Casserole, Pan Seared Chicken among others. 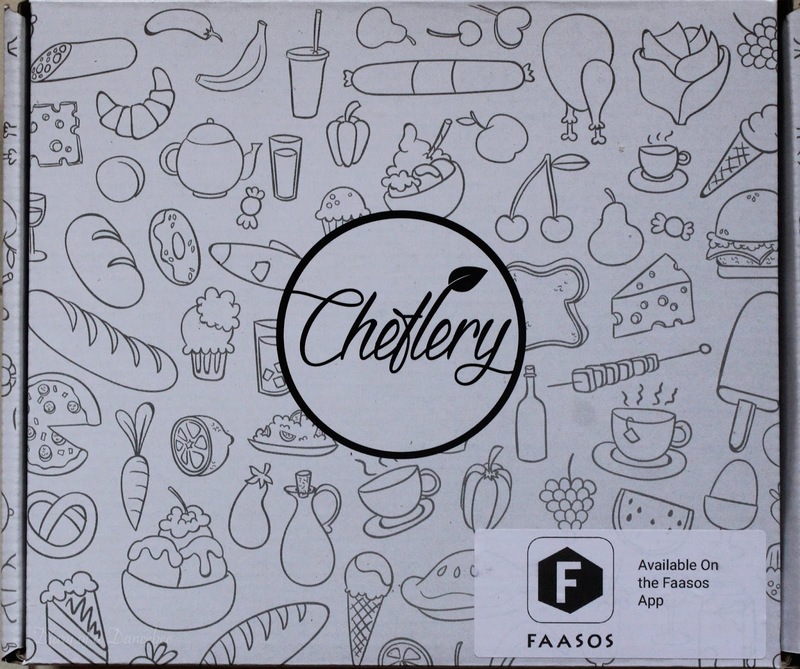 All you have to do is download the Faasos app and order your kit (or like the Cheflery page on Facebook and pre-book your kits). Try it out and you won't be disappointed!